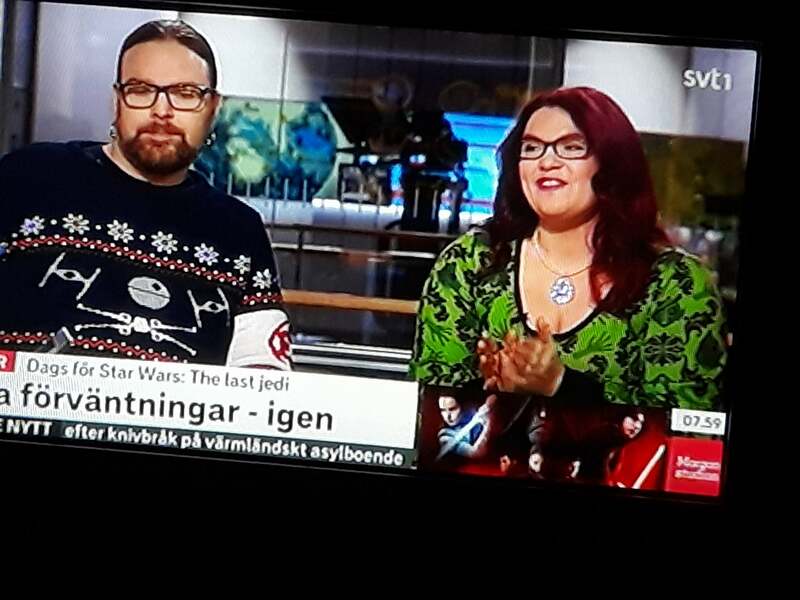 On the 12th of December the Nordic Base, Nordic Garrison and the Mandalorian Mercs in Sweden were invited to the Swedish gala premiere of The Last Jedi. We were offered 11 places in costume, and I was one of them in my TLJ Leia. I loved my TLJ Leia, I can definitely say that it's one of my favorite SW costumes ever. It's comfortable, but still very regal, and the hair held up. We mingled around with the other guests until the film started, and then we watched the film at the IMAX 3D. I got some nice photos, taken by Anna Vikmanis during the evening. The only group photo we got was taken at the end though, when our Kylo Ren and the stormtroopers had already gone to change so that they could sit down and see the film. You can see that the red carpet was actually black this time. Before the film TV4 was there and interviewed some of us as well. I had also been contacted by SVT to be on their morningshow, Morgonstudion, so it was an early morning the day after to be at the studio in Stockholm. Well they let me go in taxi from Uppsala, and their make up people made me look nice and fresh despite it being morning. My sister snagged this screenshot of me. 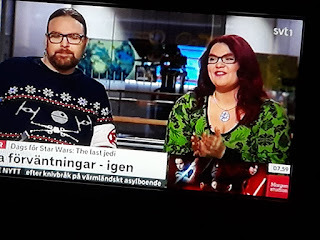 Of course I wore my Greedo-dress and R2 Pearl necklace, but I still think it was too subtle for people to notice it, the other guest was a bit more obvious in his Star Wars sweater. In the afternoon SVT:s Kulturnyheterna also made an interview. Now for this interview you have to excuse the state of my wig. I had just seen the film for a second time, and the wig had started to slide back and come undone in the back, I also had a blood sugar drop, but I still managed to be coherent. The whole first 3 minutes of Kulturnyheterna was about Star Wars. So I've seen the film twice, and when it comes to the costume there are a couple of things I want to change before I submit it to Rebel Legion, it's all to do with the hair and the jewellery. The hair in the back consists of two small rolled buns, it's basically the classic cinnamon buns but smaller and put on at the nape of the neck. I also need to trim the lace edge better on the wig. The earrings curve up behind the ear in a small tendril. The bracelet needs to be redone, both because it was actually too big, and I want it to be in a shape closer to the film. I want the one stone ring to be bigger. I like it a lot more than TFA. I think Rian Johnson did a great job and I'm really looking forward to him taking care of a whole trilogy. I've never laughed so much in a SW film, but it never turned into a silly comedy. My main issues are with plot points that were taken over from TFA, and that he simply couldn't ignore. So all in all great director that kept me emotionally invested during the film, I just wish he had had a better material to work with. If you are familiar with the old expanded universe you can say that the sequels are like the New Jedi Order book series, with TLJ being the Aaron Allston installements.